100% wild-caught fillets seasoned with lemon and butter. Load up on char-grilled flavor without loading up on anything artificial. 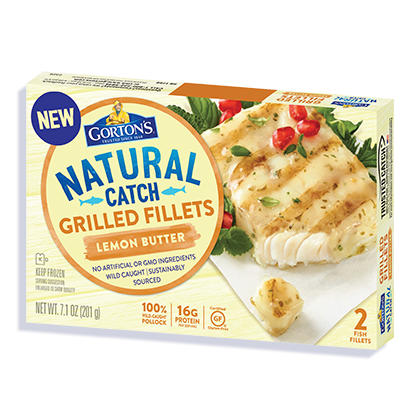 Made with 100% sustainably wild-caught fillets and real garlic and butter, our Lemon Butter Grilled Fillets are a tasty solution for any appetite that only craves the real stuff. Water, canola oil, butter (cream, salt), sea salt, potato starch, cane sugar, nonfat milk, whey, cream solids, citric acid, natural flavor, lemon peel, parsley, spices.